It's time for our Tarot Tuesday Big Reveal! If you haven't done so yet, please go to the FACEBOOK page and select your card. For those of you who have, let's get to it! Is he in danger? Did he put himself there? How did The Hanged Man get so tangled up? 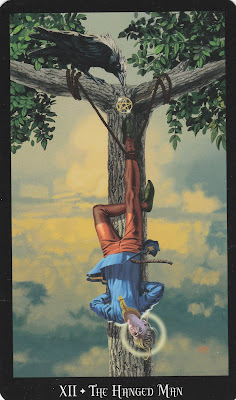 If you are receiving a Tarot reading, The Hanged Man card is a strong message from the universe that the option of surrendering is always open to you. It might, in fact, be the quickest way to a complete and total victory. In the present position, you are being urged to avoid conflict. Sometimes an enemy so dearly wants a fight that the way to defeat this person is to deny him or her that one thing that is most deeply desired. To withhold the confrontation is to be the winner in these situations. In the future position, The Hanged Man foretells of a coming battle and advises you to not be seen as an active aggressor. In general, The Hanged Man Tarot card indicates that you are in a situation with which, you are not happy. You may be feeling like you are stuck in a rut, or trapped in a situation or frame of mind that is not making you happy. The good news is that you have the power to release yourself. This may involve walking away from the situation, or simply changing your perspective on it. The Hanged Man may also signify that you may be facing a dilemma, and are unsure of what path to take. You may feel that things are not turning out the way you planned. You need to step outside yourself, and look at your situation from a different angle. Give yourself time to just relax. Stop trying to control things, and just let them be. The correct course of action will become clear to you in time. Remember, Odin hanged on the world tree for 9 days to bring us the runes. There is wisdom to be found by being still. Key words: Feeling trapped, confined, self-limiting, uncertainty, lack of direction, needing release, letting go, finding truth. The World Tarot card signifies having the world at your feet. This can be in a literal sense, as The World is one of the Travel cards of the Major Arcana. It can represent new worlds opening up for you, so you can expect to be welcomed by the people in the countries to which you travel. The World can also mean you will have the world at your feet in another sense, e.g., that you will be successful, and the opportunities available to you at the moment are endless. You have gone through the trials and tribulations, you have endured the hardships, and learned your lessons. Now, you will reap the rewards. You should be proud of what you have achieved, it has not been easy to get here but you’ve done it. The universe is smiling upon you, and luck is on your side when this Major Arcana card appears in your reading, so grab the opportunities available to you. The World can represent the completion of a challenge, such as a college course, or a project. Or, it can represent finally achieving a dream or aspiration, such as starting your own business, getting married, or having children. You have reached the point where you can be happy with what you have accomplished. Success can bring a whole new set of challenges or worries, so make sure you’re not carrying the weight of the world on your shoulders. You’ve worked hard to get to this point; so stop and savor the moment! Celebrate your accomplishments. Have you been feeling revitalized? Have you been the center of attention lately? Are you getting an award soon? Are you making a breakthrough in understanding the patterns of a relationship? Has a recent victory given you reason to be confident? 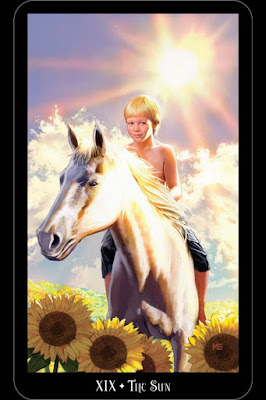 Look towards The Sun's appearance in your Tarot reading as an indicator that everything is going in the right direction for you. When you are feeling at your best emotionally, physically, and psychologically, The Sun confirms that it is no illusion – things really are going well! In the present position, you have everything to gain with this card. You can get exactly what you want, and are the center of attention. Little can be lost, and consequences are few when you reach out to take what you want. If there are any downsides to The Sun card being in the present position, it is that secrecy is almost impossible. You must operate in a transparent manner. Everyone should be able to see what you are doing, in order for your integrity to never be questioned. In general, this is a card of optimism, freedom, and fun. 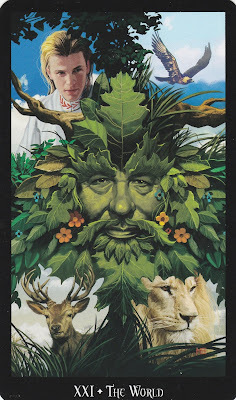 Things should be going well for you, as this card also represents success and enthusiasm. You will find that people are drawn to the happy vibes and positive energy you are giving out; and you will bring light and joy to everyone and everything with which you come into contact. You will be feeling carefree, liberated and self-assured. It is also the card of truth so if you have been the victim of lies or deception, The Sun is coming to shine its light on the deceit to reveal the truth and the perpetrators of the lies. The Sun Tarot card in an upright position also signifies good luck. Any problems you have been experiencing will melt away with the warmth this card brings. It can also indicate travel to a country with a warm climate. 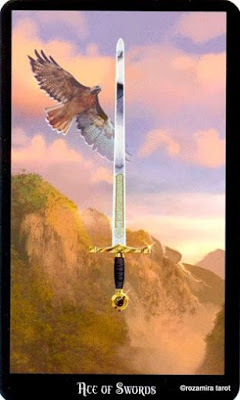 When it is time to "cut through the B.S.," one card in the Tarot deck will do the cutting for you: The Ace of Swords. This is the card that appears when communication is in need of being clarified. That is a nice way of saying that when someone is giving you a snow job about something, the Ace of Swords is with you to cut those words to shreds and find the clear meaning of them. The Ace of Swords delivers the reality of the situation to you. This is not always easy to accept, as often it is you who have been lying to yourself, denying the truth about a relationship or other intense situation in your life. This card perseveres in a quest for what is real, but your idea of what that reality might actually be is not guaranteed. In the present position, you are clarifying an absolute in your life under which you have been serving. The Ace of Swords is especially empowering in this position, because you are able to confront vagaries and inaccuracies in your life that are not adding up. The Ace of Swords gives you the strength to confront situations that do not mesh with your understanding of things, and the presence of mind to articulate your position. The Ace of Swords can also represent new ideas, new beginnings, new projects, new plans, and breakthroughs. It also indicates intellectual ability, mental clarity, clear thinking and the ability to concentrate. This Minor Arcana signifies communication, vision, force, focus, and intensity. It represents making correct decisions, being assertive, justice, and authority. The Ace of Swords can indicate good news in relation to legal matters, legal contracts, or letters that may be to your benefit. Aces represent new beginnings, new opportunities, and most importantly, potential. Potential to create, to manifest, to inspire, to love, to transform, and to break through. How can you bring mental clarity to your new journey? How can you communicate powerfully and compellingly? How can you access the truth of your new journey? Write the answers down. Take time to really think about this. With the new moon energy this week, it's a great time to utilize the energy of the Ace of Swords. How did you do? Come join us on the FACEBOOK page, and give some feedback. Questions? Don't hesitate to ask!